UNITED NATIONS, November 3 -- When the International Monetary Fund's spokesman David Hawley held a press briefing on November 3, he faced multiple in-room questions about Greece, its referendum and possible default, and when and how Managing Director Christine Lagarde knew about them. Hawley deflected all questions, saying Lagarde had already spoken, and learned about the referendum as everyone else did. A Greek journalist concluded, so "you don't have anything for today for us?" Inner City Press submitted three questions through the IMF's "online briefing center," which Hawley said will soon be re-named the "Press Center" and offer translation. More fundamentally, it seems, is for the IMF to clarify which questions submitted online it deigns to read out loud and answer, and which ignore. Hawley was about to end the briefing when he said there was "a question" from Inner City Press, which he paraphrased as, "Can I comment on current state of discussions with Ukraine?" Then Hawley offered this: "We are in Ukraine at the moment, discussions are ongoing. I prefer to wait for the conclusion of those discussions before making a further statement." "On Ukraine, please confirm or deny public reports that the IMF is urging the government to sharply raise utility prices, and comment on the public protests of the IMF in Kiev." 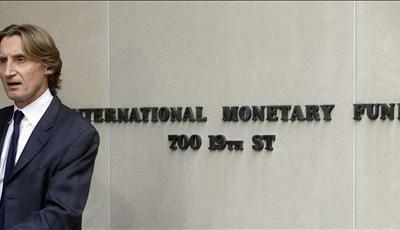 In other circumstances the IMF does offer comment, how ever conclusory, about public protests. Why not here? "Managing Director Lagarde attended UN's Chief Executive Board meeting last week. Please describe her and the IMF's coordination with the UN, on food security, climate finance and in the Horn of Africa and elsewhere, going forward." On Libya, about which Inner City Press also asked, Hawley chose a less detailed question and said the IMF "will meet with the authorities soon." Watch this site.